To celebrate The Mole finale tonight, allow me to dip back into the past. When I was a kid, I was obsessed with catching Carmen Sandiego. I’d spend a half-hour every school morning – between when the bus dropped me off and when the bell rang – playing Where in the World is Carmen Sandiego? in the school computer lab. I think the game was on one of those large, flimsy disks, which, for reasons I still don’t fully understand, was not called a floppy disk. But every morning I would improve my geography skills by seeking out, and eventually catching Carmen Sandiego. I loved being called a gumshoe. I loved the cheesy, junior high humor (I suppose it helped that I was in junior high). 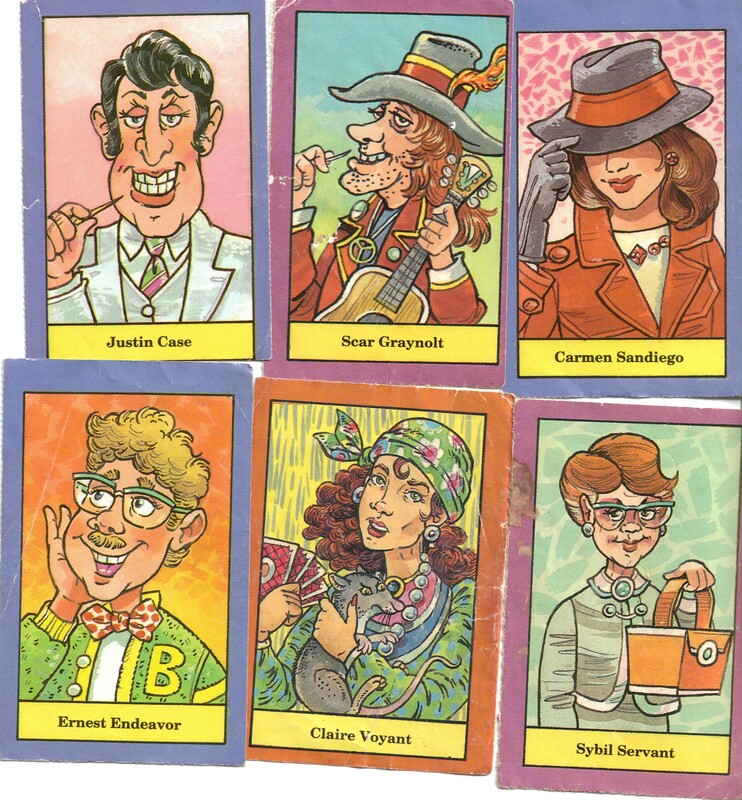 Sometime later, I discovered a series of Carmen Sandiego books which included cards on some of Carmen’s villians. I liked the drawings of these villians, their names, and their goofy characteristics on the back of the cards. For example, Phil R. Yup is a street musician who liked hush puppies and bald eagles. Sarah Nade is the lead singer in a Hawaiian punk band called the Sarcastic Fringeheads. She like Chinese food and is addicted to soap operas. The books are a lot like the Choose Your Own Adventure books. You slowly uncover clues to which villian committed the crime before you track him or her down, get a warrant, and bust them. My love for Carmen Sandiego extended further as I got older. I became addicted to the board game Clue. And, when The Mole premiered on ABC in 2001, I was giddy with excitement. It was my chance to be a gumshoe all over again! If this whole writing thing doesn’t shake out, maybe I’ll become a private detective – specializing in gnome crimes. You were right. I bow down to the Mole know-it-all. Ande: I almost think it was too easy figuring out the mole (I don’t mean that to sound all braggy!). This time I focused on the editing more than anything else. Plus, the one home-viewer clue that I picked up on was how Craig’s name was never entered into the computer. That’s why I didn’t think it was him. It was too easy of a choice. I figured the editing would tried to make it so viewers picked someone who wasn’t the mole and be surprised. I kind of started thinking it was Craig when he seemed to have all the answers for the puzzle in the last episode.